Mrs. Mary Clarke supplied this photo of former employees at Fleming Reid’s Mill probably from the 1920’s. Her mother, Mrs. Annie O’Donnell (nee Holland) is in the photo on the extreme left of the back row. 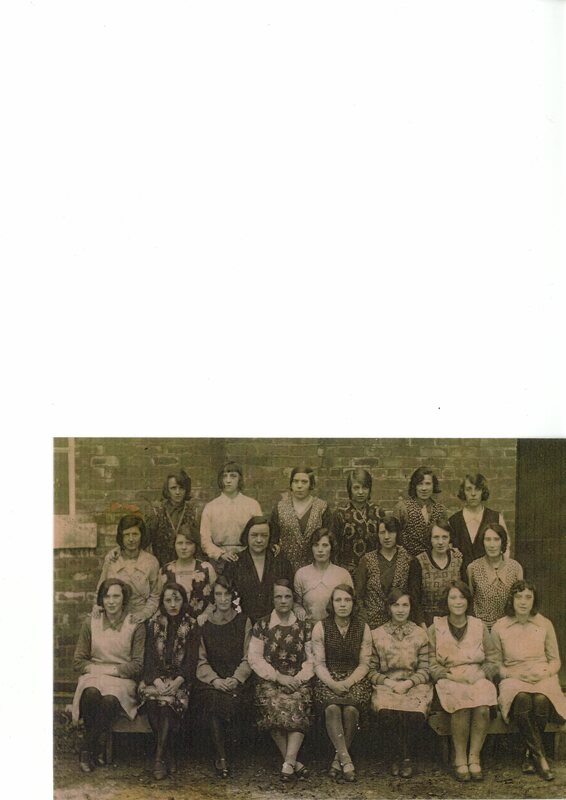 Her mother’s sister, Rosie Gillan (nee Holland) is also in the photo, in the front row second from the left. Mrs. Clarke was able to remember some of the names of the girls in the picture, three of whom were called Peel. Back row left to right: – Annie Holland, Mattie Mc Bride, Margaret Mc Cartney, Helen Reid, ??? ?, Bridget O’Hara. Middle row: – Nelly Mullan, Jeanie McNeil, M Mc Laughlan, Mary Stewart, ? Drummond, Jean Peel. Front row:- Katie Peel, Rose Gillan, ??? ?, Rosie Roberts, Mary Straine, Jessie Moores, Margaret Currie, Nelly Peel. Annie O’Donnell and Mary Straine were best friends. Mary Clark herself worked in Fleming Reid’s for a time. Her job was to collect the wool once it had been washed so that it could be made into balls and have the band put round it to say what ply and what type of wool it was. They were on piece work and Mary would ask to take the wool away when it wasn’t quite dry so that they could “get on” and not be held up resulting in a lower wage for them.